When I told my friends that I’m going to spend my free time in 2016 doing the One Side Project Challenge and make another website builder, many of them were quite surprised. It’s a daunting task to contribute to a crowded and mature market space with players like Wordpress, SquareSpace, and many others. So, what can I do differently? 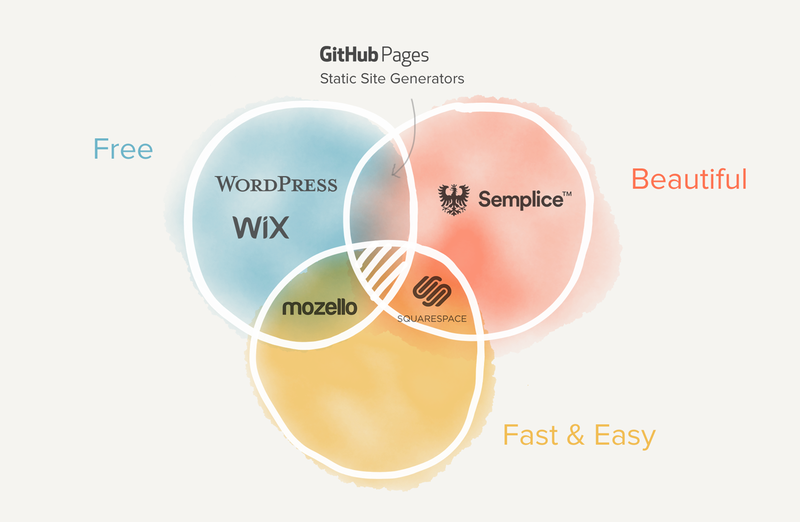 I’ve used and recommended those existing solutions in the past, but I find that there is still no free service to help you quickly create elegant, simple web pages. And not only is there no free, beautiful, and nimble solution, fast-and-easy solutions themselves are really rare. Many services claim they are easy to use but they still cost a lot of time overall. Enabling the end user to choose so many design elements is counter productive because every decision costs time. I often see that people spend more time tweaking small design details on their web page rather than writing and preparing great content. However, what difference does it really make to change the font from 24 points to 26 points when you are trying to start a project? Eliminating all the unnecessary choices is way more productive. Customization options make it way too easy for less design-savvy users to ruin the original design. Get any beautiful template and set the title font to be Comic Sans and the color to cyan, and you will know what I mean. 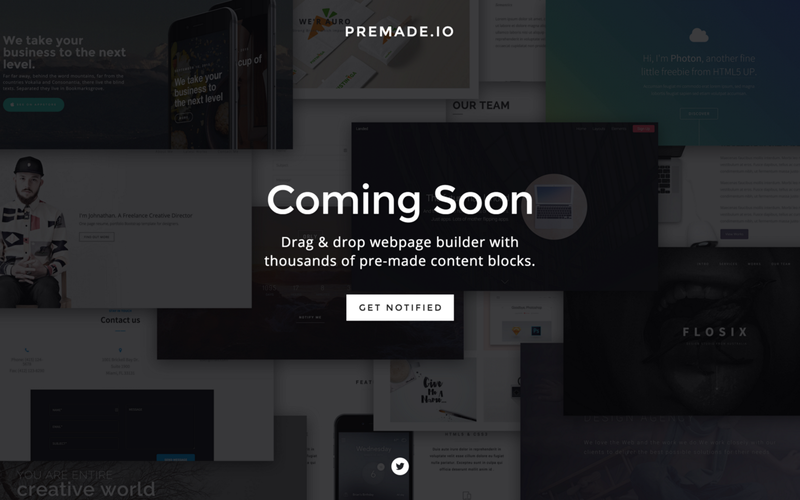 Therefore, I’m going to make Premade.io, an elegant, nimble, and free web page builder with little to no customization options. By avoiding unnecessary options, it will be doable for me as a side project, and it will also be the fastest web page builder ever. For you, I have an answer. Instead of giving you customization options, I will give you more blocks to choose from. Lego doesn’t make it easy for us to cut and melt its blocks, but it does provide us with a great variety of different blocks to build with. The idea is to have many stupid building blocks rather than a few very intelligent building blocks. It’s much easier and faster to build, and the end result will always be beautiful. So how do I turn this idea into reality? I’m planning to code the platform and utilize all the high-quality free HTML template resources available to make a minimally viable free service to validate the idea. As long as a block is self-contained, it will integrate well within the system. I’m planning to make this a open source project. I hope it can be a new platform for the best HTML templates and blocks out there. In fact, I already made my source code public on GitHub. 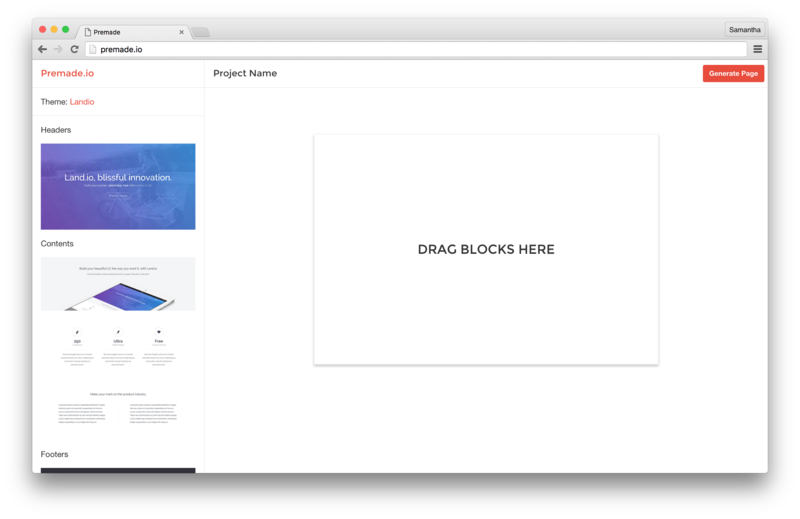 If you are a designer or a developer interested in providing free or paid PSD / Sketch, or HTML blocks for Premade.io, fill out this form please :) I will personally reply to each one of you. I will hold the standard very high, being as selective as I can, to keep the overall quality high and the time cost for picking themes as low as possible. I think though the platform user experience can hopefully get Premade.io started, it will be the community and the content that keeps it going. And that would eventually be the competitive advantage against similar services like Tilda, which just came out last week. Oops, I didn’t see it coming. But I know more similar services will appear in the market, as I believe that’s the future of building websites. I had this idea for a while and the first thing I did is to make a bare-bone prototype just to make sure I can actually code a platform like this. Being mostly a designer, this is my first user-facing coding project, and getting the most technically challenging part figured out is great. Did that in 2015. And then, I think it would be great if I can spend the whole year of 2016 to try to make it into a real service. As you can see, there are many pieces to this project: the marketing, the community, the messaging, all needs work. It’s not a build-it-and-bounce kind of side project. That’s when the idea of the One Side Project Challenge came up. When there’s no marketing budget, I think writing good content and sharing the whole process is the best marketing I can do. Then on Jan 1st, when I published the idea listicle post(50+ Inspiring Side Projects to Follow in 2016), I made a simple cover page as the landing page on SquareSpace to see if I can get some subscribers before even having a product. That’s usually a good idea validation step as well. Paid $5 for that. And as the article got attraction, I’m happy to see that there are people signing up for the newsletter. Premade.io now has more than 280 subscribers! I think it’s a great starting point. The UX is largely influenced by Designmodo’s Generator. It’s great! I really hope they do more than just HTML download. And if you are interested in this project, please do sign up for the newsletter so I get a better idea if there could be a product-market fit. So next month, I will mainly be validating this prototype and this idea in general. I will send out surveys and I will be all ears. I will make a product video to put on the landing page and see if a video helps conversion. And other than those, I will keep developing on the top items you vote on! I will be posting monthly updates on the 9th of every month. So keep an eye on March 9th for my February updates. As always, hit the 💚 recommend if you enjoy reading it, and follow One Side Project Challenge for future updates on both this and other inspiring side projects in 2016. Design Lead @GraphiqHQ. Writer @alistapart and @TutsPlusCode. Product maker. Data nerd. Side project ninja. More at http://samanthaz.me and @moyicat. 50+ Maker-writers each making one side project in the year 2016 and give monthly updates to share their process and experiences.